What is MOVEX | Logistics? MOVEX | Logistics controls all processes related to logistics and shipping, totally independently of the sales channel, product range, warehouse size or automation level. The backend software provides flexible warehouse solutions for individual requirements: Complex omnichannel strategies can therefore be implemented in addition to traditional mail order business or multi-client logistics. Regardless of whether your company is a start-up or big player in online retail: MOVEX | Logistics impresses due to its scalability and adaptability. How does MOVEX | Logistics work? MOVEX | Logistics implements all of the core functions of warehouse management: It contains all of the important processes, ranging from inventory and warehouse management through to delivery, Track&Trace and returns handling. The warehouse software supports customized picking strategies, Pick&Pack and shipment processes as well as the integration of any fulfillment partners. 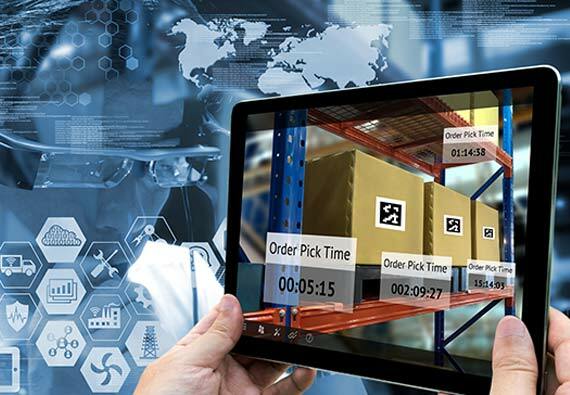 Omnichannel retailing can be implemented easily thanks to the integration of stock at store level and virtual warehouses. The pick strategies for putting together consignments are just as varied as the warehouse sizes. As well as the more traditional inventory handling with lists or labels, MOVEX | Logistics also supports paperless processes via mobile data entry (MDE). In addition, studies are currently being conducted on the innovative Pick-by-Vision method, whereby MOVEX | Logistics is linked with a data headset. Do you have questions regarding MOVEX | Logistics?